This section of Discover Dante introduces Paradiso. We begin with an overview of Dante's idea of Paradise and the cosmos, before working through the text. In the case of the final cantica, the cantos are divided into the different Heavens of Paradise, and major themes are discussed as we move through the text. Paradise, according to Dante, is the heavenly abode of God, the angels and the blessed. As presented in the Paradiso, Dante's idea of Paradise is tied to his understanding of the cosmos. Throughout the study of the Paradiso you will find it useful to consult the diagram of Paradise at the start of your edition of the text, as well as the diagrams found here. 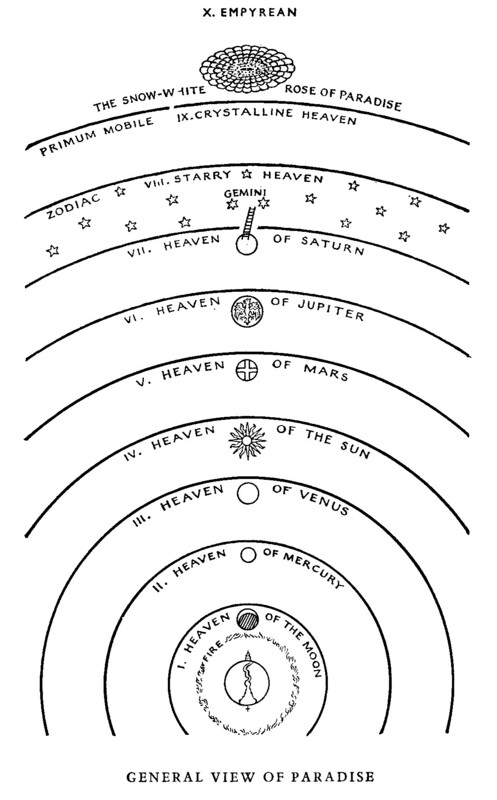 As you'll see from these diagrams, Dante's understanding of paradise is constructed around his idea of the cosmos as having the earth at its centre and, around the earth, ten heavens. The terrestrial globe, for Dante, is constituted by earth and water, and is surrounded by a sphere of air, which in turn is surrounded by a sphere of fire. Above this sphere of fire are the ten heavens: the Heavens of the Moon, of Mercury, of Venus, of the Sun, of Mars, of Jupiter, of Saturn, of the Fixed stars, the Primum Mobile and of the the Empyrean. The idea adopted by Dante of a cosmos with the Earth at its centre surrounded by the heavens is generally referred to as the Ptolemaic understanding of the universe (after Ptolemy, an Alexandrian polymath of the second century A.D.). This was broadly shared by all mediaeval thinkers, though different thinkers have different opinions regarding the exact relationship between God, the different heavens and earth. Together, the earth and the spheres of air and fire make up the ‘sublunar world’. This is the only part of the cosmos which is subject to change and corruption, as the four elements, earth, water, air, fire, can change into or mix with each other. The celestial world, on the other hand, is not subject to change and corruption as it is made of a fifth element–ether–which cannot change or mix with any other element. The whole cosmos, according to Dante, ultimately depends on God who, as the ground of all being, exists beyond space and time in the Empyrean. The Empyrean is an immaterial heaven, made up only of the love and metaphysical light which God is. It is in the Empyrean that the angels and the blessed also dwell. As we shall see, however, throughout his journey Dante also meets different groups of souls in the different heavens. Dante’s understanding of the Empyrean is one of the most important parts of his idea of paradise.